A nice hot cup of coffee always helps me to get out of bed in the early morning hours and stay productive at the workplace. Nothing feels nicer than a hot beverage especially when it is freezing cold outside! This is why I recently invested in an electric mug heater. If you are constantly as busy as I am, you are familiar with the struggle of not having enough time to finish your coffee or tea in one go. After some time your drink becomes cold, which is far less enjoyable. Mug heaters, on the other hand, will do the job of keeping your drink warm while you are busy with your daily routine. A mug warmer operates by the flow of electricity into the heating coil inside the appliance once it is plugged in and switched on. The heat and thermal energy is then transferred to the cup and keeps the liquid warm. There are indeed a lot of different mug warmers in the market. However, before purchasing my own, I spent a lot of time researching and came up with 9 best mug warmers that I wanted to share with you! 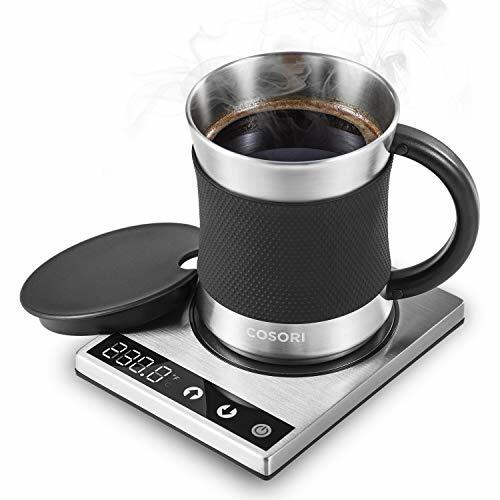 Cosori Coffee Mug is currently the best selling warmer for a coffee cup in the market in 2019! This amazing stainless steel product is constructed with a water-resistant plate and an LED display. Besides, it is extremely easy to use and you can even switch between °C and °F, depending on your individual preference. In addition, the product is also FDA-approved and has a cool-touch handle, so you never have to worry about accidentally burning yourself. The silicone slip-resistant sleeve will prevent you from dropping the drink, which is very important in my opinion. Overall: great product for those looking to keep a large capacity of liquid hot for a long time. 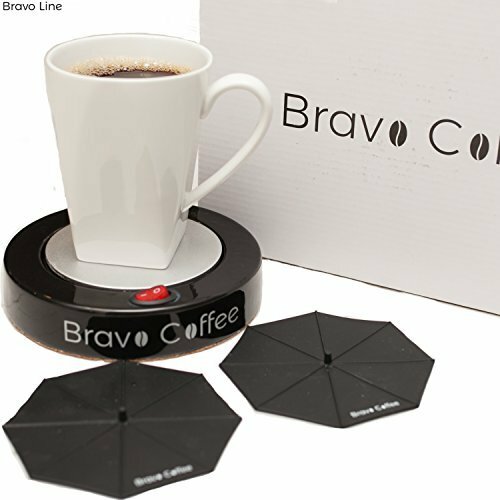 This is another great mug heater with a metal waterproof heating plate that will keep the drink warm for a prolonged period of time. You do not have to worry about accidentally spilling the liquid on the warmer and damaging it as it is spill-proof. Besides, the cup warmer is also fire-resistant and heat-resistant. Finally, this plug-in mug warmer is constructed with an adjustable temperature control making it ideal for keeping your drink warm. 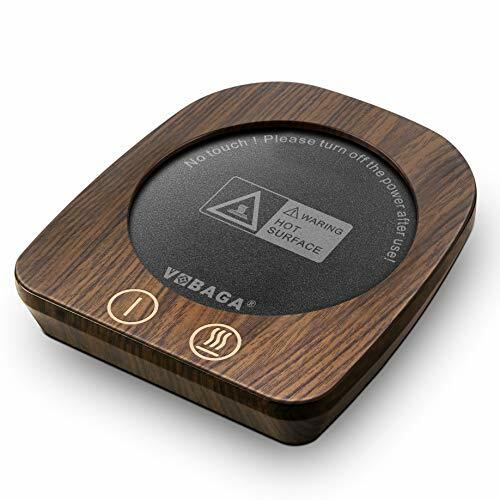 What I like about this product the most is its unique design which is suitable for office, home, travel, and dorm use. The device is constructed with a heating plate which will keep the drink nice and warm for a long period of time. In addition, this mug heater comes with an on/off switch together with neon light indicator. Overall: good choice for those looking for a reliable coffee cup warmer. Are you looking for the perfect large mug warmer for you or your loved ones? Say no more. 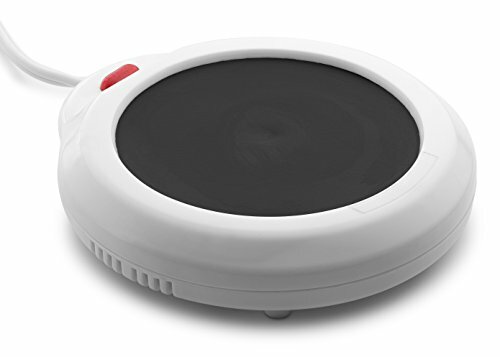 This mug warmer is one of the most reliable mug warmers currently on the market! 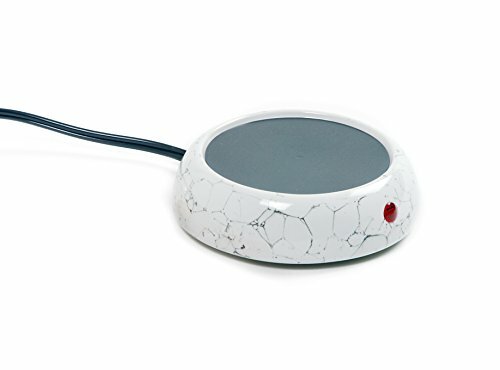 The device quickly heats up due to ceramic heat sheets and metal heat conduction. Besides, it is also fireproof, so you never have to worry about an accident. With this product, you can choose between two temperature control modes: 131℉ and 176 ℉. This can be done easily by pressing the temperature button located on the device. This amazing product will not only heat your coffee or tea but also candles and depilatory wax! Sounds like a dream, doesn’t it? 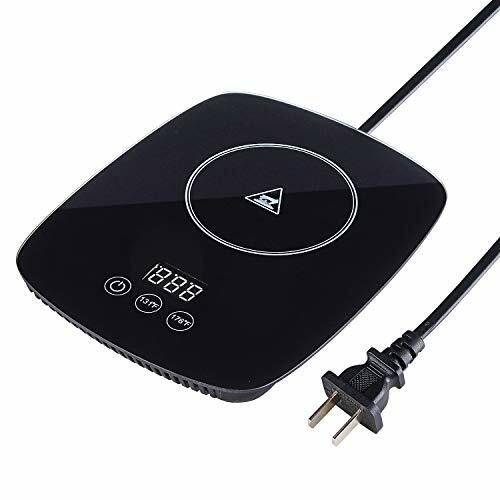 Moreover, this plug-in warmer heats off and cools down almost instantly due to the special quick-cool technology. This device will keep the drink at the perfect temperature for a prolonged period of time. What I like the most about this product, is how easy it can be cleaned. It is constructed with a special black heating surface and a brushed silver plastic edge, making it ideal for quick wipes after each use. Are you looking for a high-quality portable mug warmer? If so, then you have found the one! 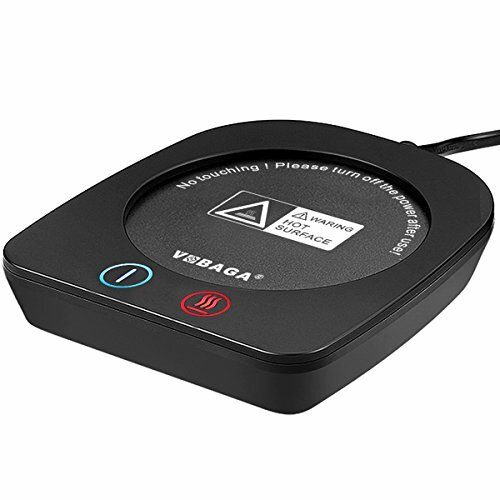 This device is UL approved and great for office use, home, kitchen, and even camping! The mug warmer is extremely easy to use, all you need to do is plug in the power socket to the wall outlet and you are ready to go. It will keep your beverage warm and enjoyable throughout the day. Unlike many other mug warmers in the market, this one has a non-stick surface, which is very convenient in my opinion. This cute teacup warmer is the perfect gift idea, especially for a child. Who doesn’t love Disney? This device will keep the beverage and soup warm for a long period of time, so you do not have to worry about rushing and consuming it while it is still warm. 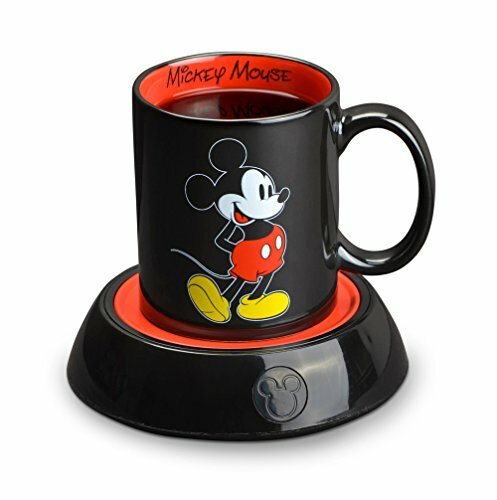 The Disney Mickey Mouse Mug Warmer got your back! 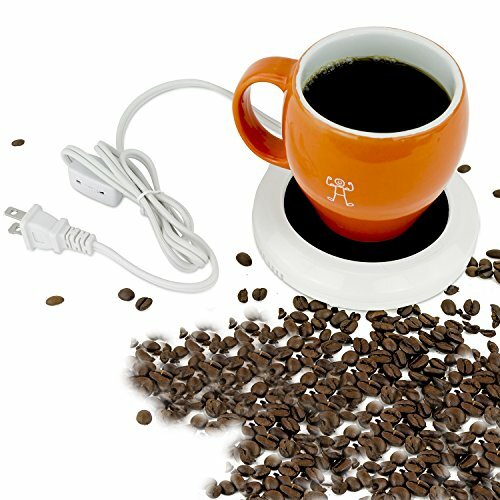 The mug warmer comes with a long cord, unlike many other similar products. It even has an illuminated Mickey power light. Isn’t it amazing? This product is one of the best large mug warmers with an automatic shut off function. It is suitable for mugs of any size and comes with two silicone lids that will prevent spillage. This mug warmer is waterproof due to its aluminum alloy plate and a ceramic casing which insulate the heat and optimize heat reduction. This magical device will keep the beverage at the most ideal temperature of 180˚F for over 3 hours. This hot plate for coffee cups is very reliable and safe to use due to its waterproof and low power heating body construction. Besides, this incredible electric mug warmer is fire and heat resistant. It comes with 3 choices of desirable temperatures, such as 104℉, 131℉, and 149℉. Can plastic cups be used on a beverage warmers? It is not recommended to use plastic cups on mug warmers due to the possibility of the cup getting melted. The mug warmers are not designed to keep the liquid in plastic warm, it should be used with a regular coffee/tea mug. How do you keep coffee warm in a mug? The coffee in a mug can be kept warm in several ways: my microwaving it, using a candle warmer, or wearing a cup sleeve on the mug. Though, from personal experience, the most efficient way to do so is by obtaining a coffee cup warmer. Why are cordless (battery operated) mug warmers are bad? They are proven to be failing at generating enough heat to keep the liquid at the desired temperature.